The Library of America recently published Virgil Thomson: Music Chronicles 1940–1954, which gathers hundreds of reviews and several essays by a musician who did double duty as a composer and a critic. Tim Page, who edited the collection, describes Thomson’s importance and the many joys awaiting music lovers who encounter his writings for the first time. What’s the aim of this collection? What sorts of pleasures and insights do you hope readers will find? Virgil Thomson wrote about music so vividly that one can almost hear it on the page—it was an extraordinary gift, almost synesthetic. He invokes the years before and after World War II and summons a musical civilization that has now largely vanished. We wanted to preserve the best of Virgil’s music reviews for the New York Herald Tribune, for which he was music critic from 1940 to 1954. He published three large collections of his work during his lifetime, as well as a paperback selection in the late 1960s that gathered some later reviews. We included all of these pieces, and added about 100 pages of reviews that were never reprinted. 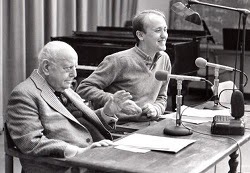 Why Virgil Thomson in The Library of America? How would you characterize his contribution and legacy? His influence? Criticism is an art in itself, and a number of American writers—Edgar Allan Poe, Henry James, and Willa Cather among them—have practiced this art as journalists at the highest level. Virgil was likely the best American music critic—indeed, perhaps the finest such critic who ever worked for a daily newspaper. He wrote about music as a professional, without undue romanticism and with a healthy suspicion of what he called “the music appreciation racket.” He was brilliantly succinct and funny and he managed to demystify an art that was often regarded as otherworldly. What makes Virgil so wonderfully interesting is his use of the English language and his ability to convey pretty complicated musical ideas in terms that all readers can understand. How did you come to know Virgil Thomson, and how did you come to edit this collection? We had met in 1979 but he never remembered me until I began to publish in The New York Times a few years later. He liked my criticism and asked me if I, along with my then-wife Vanessa Weeks Page, would edit a collection of his letters. The book was published, Virgil was pleased, and we were asked if we would compile a collection of his complete music criticism. We ended up with a huge amount of material, enough to fill several volumes, but for a number of reasons the project was shelved in the mid-1990s. Twenty years later, I got a call from The Library of America, for whom I had also assembled two volumes of the writing of Dawn Powell. We decided not to do all of Virgil’s work—like many critics, he had to do some hack work every now and then—but we kept the best of it, and the book stands as a monument to his originality, audacity, and importance to musical thinking in the mid-twentieth century. Why a book of writing about music? What’s the connection between writing-writers and composers-musicians in this period? You learn a great deal about an art when you read articulate reviews of practitioners of the art. Many composers have been fine critics—one thinks immediately of Schumann and Berlioz and there are others. None was better than Virgil Thomson. And the staff of writers that Virgil brought to the Herald Tribune was remarkable—Elliott Carter, Lou Harrison, Peggy Glanville-Hicks, John Cage, William Flanagan, Arthur Berger (who had a staff position), and many more. What was the Herald Tribune’s contribution, and place, in cultural life during the years Thomson worked there? The Herald Tribune was liberal, educated Republican in its outlook, back when the GOP was far less populist than it is now. It placed a high premium on good writing, unlike the much more literal (back then) New York Times. Virgil arrived as what our parents might have called a “whippersnapper”—a gifted composer known in avant-garde circles with a cosmopolitan Parisian background of which he made much. He could be maddeningly arrogant and dismissive but he was also so brilliant that the paper not only put up with him but spurred him on, much to the outrage of more traditional musicians. What parallels/contrasts would you draw between Thomson’s world and the classical music world today? We’re living in a vastly different era. As recently as thirty years ago, all four of the New York general-interest newspapers (the Times, the Daily News, the New York Post, and Newsday) had staff classical music critics, and the Times had five or six of them. Today, I would guess that less than twenty people in the United States make their living mostly as music critics. The New York Times, The Washington Post, and the Los Angeles Times are all down to one staffer each. Information is spread very differently than it was, and an education in classical music is no longer to be expected of one’s audience. There are some advances—internet reviews and the general understanding of technology that allows our young people to create their own experimental music at home for next to nothing—but much has been lost, too. It always seems to be the best of times and worst of times, doesn’t it? There were a number of reviews of artists and compositions that have inspired much recent interest that Virgil did not include in his own collections. Aficionados of the baritone Gerard Souzay, the Brazilian singer Elsie Houston, the violinist Ginette Neveu, and the pianist Michelangeli, among others, will be interested in what Virgil had to say about them. When Virgil was putting together his own collections, I think he had his eye on posterity and tried to leave out some reviews that will strike many later readers as “wrong.” He panned Benjamin Britten’s “Billy Budd,” for example—and wait till you see what he wrote about the Mahler “Resurrection” Symphony! What do you consider the most important thing you learned from the example of Thomson’s criticism about writing music reviews and music articles? Did Thomson ever offer you any practical advice as a writer? Virgil read my Times work regularly and was never hesitant about suggesting ways I could have improved it. He taught me to be clear, succinct, and descriptive—also not to fear wit as long as it was organic and didn’t seem tacked on. I could be coy and say that I’d choose whatever one I’m reading now! In fact, that’s pretty close to the truth. For me, the joy of this volume is the immersion into Virgil’s sensibility, and that holds steady throughout the book. When I put it down, I miss his company. an interview recorded in 1948, shortly after the publication of The Art of Judging Music, which is included in its entirety in the new Library of America edition.